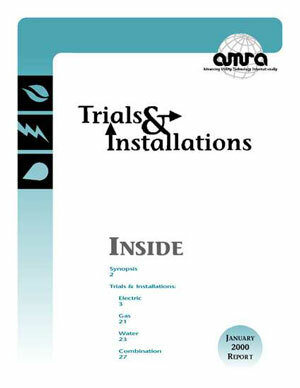 The Trials & Installation Report is a biannual reports that detail ongoing automatic meter reading trials and installations at utilities and service companies around the world. Listings are grouped into electric, gas, water, and combination-utility categories, and include the utility company's location, customer base, size of deployment, suppliers of equipment and services, and comments that outline circumstances specific to particular projects. The report, published each year in January, contains listings of hundreds of ongoing AMR projects; the Trials & Installations Update, published each July, lists projects launched or significantly altered since the publication of the previous January's report. Utilimetrics: The Utility Technology Association, 60 Revere Drive, Suite 500, Northbrook, IL 60062. Tel: 847-480-9628; Fax: 847-480-9282.